When purchased by Robert MacDonald in April 1924 from the Edinburgh agents, Alexander & Co, ‘SG 8730’ was the highest specification Brough Superior available – the SS100 was not to appear until later that year. In addition to being fitted with the new four-cam/twin-camshaft JAP sports engine and Brampton Number 2 forks, it was also supplied with the relatively uncommon Binks ‘Mousetrap’ competition carburetor, as fitted to the earliest SS80s. (Later SS80s featured Webb forks and ‘touring’ carburetors). Also fitted were the (now very rare) Binks matching twist-grips for ignition advance/retard and throttle, complete with matching rubber grips. To round off the specification, Robert MacDonald fitted the best available speedometer: a 100mph Bonniksen, complete with trip meter. ‘SG 8730’ was first registered in Edinburgh, possibly by the Brough agents, since its owner lived in Fortrose before he moved in 1927 to Edinburgh where he used the SS80 to commute to work at Murrayfield Stadium. In 1928 Robert’s work took him to Stornaway on the Isle of Lewis. A surviving invoice shows carriage to Stornaway at £1! In 1930, now a married man, Robert had a minor accident on the Brough, resulting in a damaged fuel tank and a broken float chamber. As a result of this accident (reputedly) his new wife and mother-in-law banned him from riding and the Brough was taken off the road and laid up in his garden shed, remaining there until 1975. Following the accident the Brough works had supplied a reconditioned 1925 fuel tank (No. 1192) to replace the damaged original (No. 738). This replacement tank was kept in Robert’s study and never fitted to the bike. In the mid-1950s Robert considered returning the Brough to road use. Surviving letters from Brough Superior, Amal Ltd and Gagg & Sons of Nottingham show that he attempted to obtain some spares including a new wiring harness and a replacement float chamber but was deterred from proceeding after being informed that all the parts he needed were obsolete and unobtainable. Luckily this resulted in ‘SG 8730’ remaining in the shed in its original state. Amal even recommended that he return the Binks Mousetrap in exchange for ‘one of our latest needle-type instruments’. Fortunately, he ignored the suggestion, thus saving the bike from a 1950s up-rating. On his retirement in 1975, Robert moved from Stornaway to Fortrose, the Brough being transferred for safekeeping to his son John’s home in Calendar, Perthshire. In 1984, John inherited the Brough on his father’s death and continued to store it in his garage without ever using it. In 2007, ‘SG 8730’, previously unknown to the Brough Superior Club, was discovered by an overseas tourist at the rear of John’s local garage where it was in for a quote for restoration. 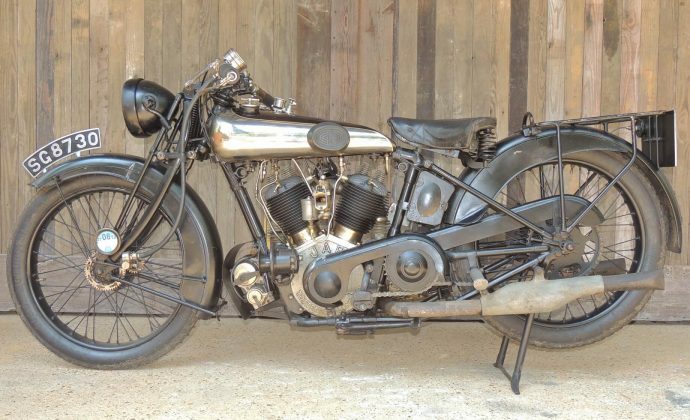 A photograph of it was posted on the Brough Superior web site, which created great excitement and attracted serious offers from Holland and Germany. Despite these offers John MacDonald chose to sell the Brough to the current owner, preferring it to remain in the UK (see ‘as purchased’ photographs on file). Five surviving tax discs, including the final one issued in 1930, show that ‘SG 8730′ had only been taxed for a maximum of five of its 83 years’ existence. Being a uniquely original and unmolested SS80, various options for its renovation were discussed with Mike Leatherdale, the Brough Superior Club Registrar, and Tony Cripps, the well-known Brough restorer. It was agreed that the correct decision should be to conserve the Brough rather than restore it, the objective being to retain as much originality as possible while returning it to perfect running order. Tony Cripps was entrusted with this task. The Brough was completely stripped down for examination. All reciprocating and rotating components were checked and refurbished or replaced as necessary. Since the cylinders showed little wear, they were lightly honed but not re-bored, and new (standard) pistons were fitted together with new big-end and small-end bearings. The cycle parts were cleaned of all superficial rust and airbrushed with semi-matte paint to protect them from further deterioration. The Brampton fork springs had stretched from having stood for a long time and were replaced. With the exception of the fuel tank, all nickel-plated items were left ‘as found’. Original outer control cables were retained wherever possible. There was some damage to the gear teeth, which was rectified by using original Sturmey-Archer parts. It is worth noting that the gearbox is the original – very few Vintage-era Broughs still retain their original gearboxes. The only significant non-original components are the new tyres/tubes, the replacement petrol tank supplied by Brough in 1930, and the headlamp reflector, which was missing when the bike was found. 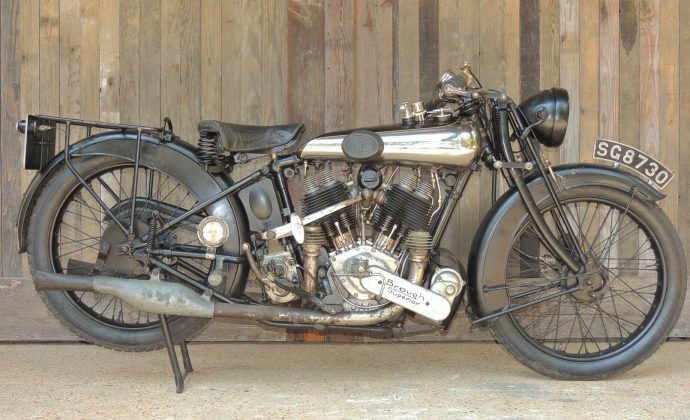 On completion of its rebuild the SS80 took part in the Brough Superior Golden Jubilee Rally in 2008. ‘SG 8730’ is unique in that it remains exactly to the original specification as supplied by the Works in 1924. Although a veritable ‘time-warp’ survivor, it nonetheless is now in perfect working order and comes with a current MoT certificate, road fund licence to August 2012 and Swansea V5C registration document. Perhaps this SS80 can best be summed up by the immortal words of ‘Cyril’ Wagstaff: ‘this is what Broughs used to be like before the restorers got at them!’ It is among the most original early SS80s in the world.